Trigger warnings for this film: Homophobia, racism, sexual abuse, abuse, animal abuse, natural disasters and drug usage. 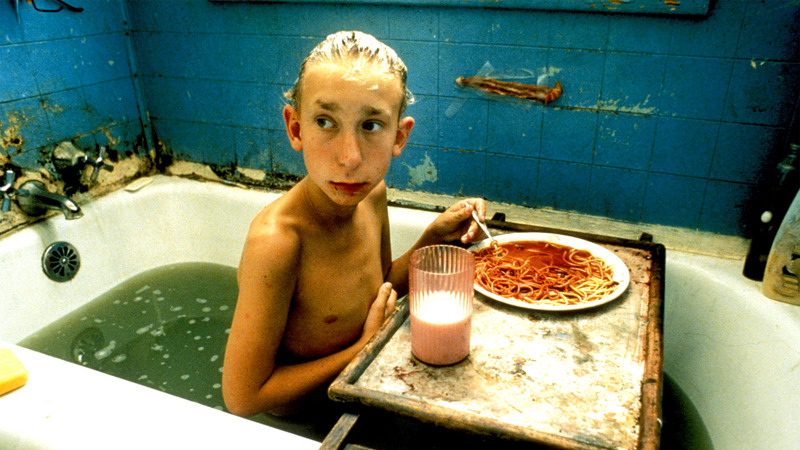 Gummo was directed and written by Harmony Korine, and tells the story of Xenia, Ohio a few years after a devastating tornado which killed half of the town’s population. It has no formal beginning, middle or end, and is composed of polaroid stills, super eight film and found home movies, with professional 35mm film for important, plot heavy scenes. This collage-like organisation was planned by Korine from the start, as it mirrors the tornado and creates coherence out of chaos. The film is only 75% scripted, and out of the forty speaking roles available, only five were played by experienced actors. Still from the bath scene – note the bacon taped to the wall. The incoherent story follows two young boys, Solomon (Jacob Reynolds) and Tummler (Nick Sutton) on a regular day in their nihilistic, lonely lives. They order milkshakes, huff glue, and shoot stray cats in order to make money, selling them to the local meat market for a dollar a pound. Solomon is by far my favourite character in Gummo, he retains a childlike, innocent aura whilst committing all the terrible acts he and Tummler embark on – You can’t help but feel sorry for Solomon being stuck in this sad, deprived world he is forced to exist in. Tummler, on the other hand is pure sadist. He often seems to have a hatred for life, where Solomon expresses that he still loves life and finds beauty in it despite the hopeless setting of Xenia. There are other stories interspersed between Solomon and Tummler’s as part of the collage. Among these are three sisters and their black cat Foot-Foot, various other standalone scenes about other residents, and the mysterious Bunny-Boy who doesn’t speak at all within the movie, but is widely considered a homeless orphan. These stories mix between each others and create an impression of what life is like after the tornado, the outlook is often miserable. Drug use, homophobia, racism, vandalism and abuse are few of the horrific hostilities that work together to paint this picture of Xenia. Young children shout homophobic slurs and profanities over and over again at a ‘dead’ Bunny-Boy, a girl describes the sexual abuse against her by the hands of her father, there are countless scenes involving drug abuse, violence and hatred and it is assumed that this hostility and corruption is common throughout most, if not all of the resident’s lives. The imagery put across in the film sticks with you long after it’s over, and throughout the time spent watching it, you are overwhelmed with a slight feeling of unease and discomfort about the reality of these shots. Often you will find yourself asking ‘Is this scripted?’, and 25% of the time, it’d be a real person’s emotional confession or sheer anger. This unrest experienced while viewing Gummo, I feel, communicates that Korine’s job was done well – His portrayal of American poverty is painful and sad and terrifying to watch, but entirely objective and unromanticized, which is exactly how these issues should be dealt with. 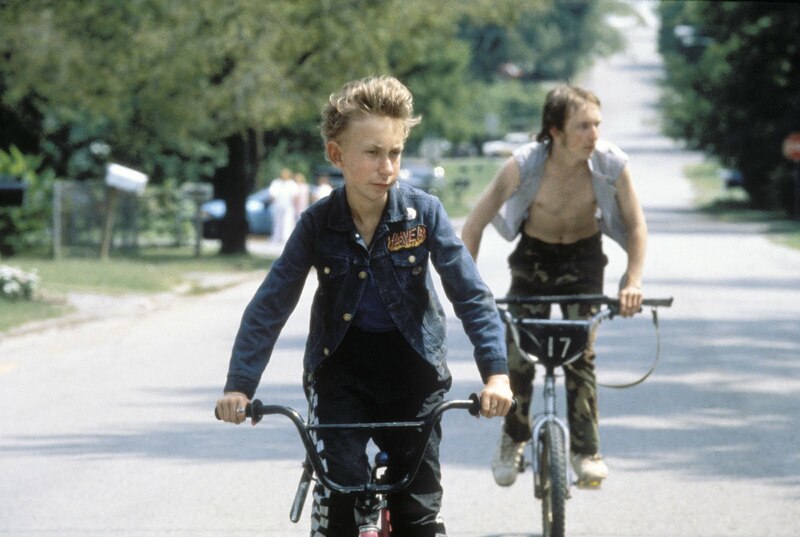 Many people accuse Gummo of being a shocker flick due to it’s violent scenes, but in this context, they enhance and emphasise the violent and hostile atmosphere people like Solomon and Tummler live in every day all over the world. Gummo may be ugly, offputting, and sometimes difficult to watch, but the meaning behind the snippets of Xenia collected throughout this film and the unique feeling Korine’s films inspire in human beings is entirely worth the watch.